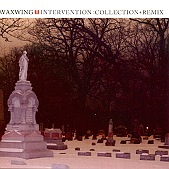 Compiling the first five tracks off of 7"s and a compilation, a re-mixed version of "Laboratory", and three live songs, Waxwing's Intervention: Collection + Remix will tide fans over until their next full-length comes out. From the soft inner workings of the drippy indie rock opener "Intervention", through the crashing punk rock of "Manicotti", through the melodic "Laboratory", Waxwing create jagged, precision-free indie rock that trades on the flaws and beauty of emotion in the flaws rather than glossing up everything. And it is because of this that the band thrives, as is evident on the live cuts. "New Years Day" comes alive, twisting and burning, as front man Rocky Votolato cranks out soft-to-loud thrashing indie rock soaked in melody. And the live version of "Laboratory" gives you another look at the song, this time the passion and rock brought to life by the light melody hanging over its head. A treat for fans of the band that want to explore this band more than they could on a full-length studio record. I'll give it a B.